The seven main chakras locations are well known by acupuncture and acupressure specialists. Here is all you ever wanted to know about these seven main chakras, including their colors, associated elements, animals, locations and meanings. Chakras are “wheels” through which you can improve your spiritual, physical and mental consciousness and improve many facets of your life and the life of those around you. Learning more about the seven main chakras locations is just a starting point on your long road of discovery about what your chakras can do for you. 1. Base (or Root) Chakra. This chakra is represented by the color red and is located at the base of the spine. It has four petals, which represent the four cardinal directions and is associated with the earth element. The animal that represents this chakra is an elephant that is bound to the earth. The opening is facing downwards, towards the ground and this chakra is related to the kidneys, intestines, spinal column and adrenal glands. In more psychological terms, it is connected to how our physical body interacts with nature and our roots and affects our will to live and physical energy. 3. Solar Plexus Chakra. This chakra is represented by the color yellow and is located below your breastbone and slightly to the left. It has ten petals, which represent a smoky rain cloud that obstructs the sun (color yellow) and the need to use our own energy to burn up the cloud. This chakra is associated with the fire element. The animal that represents it is the ram. This chakra has two openings, facing front and back and this chakra is related to the stomach, liver, gall bladder, pancreas and nervous system. In more psychological terms, it is connected to our will-power and determination, you intentions towards your health and where you see yourself in the world. 4. Heart Chakra. This chakra is represented by the color green and is located in the middle of your breastbone and above the chest. It has twelve petals and is associated with the air element. The animal that represents this chakra is the gazelle. This chakra has two openings, facing front and back and this chakra is related to the heart, blood and circulatory system. In more psychological terms, it is connected to love and compassion in the wider sense of the term, an unselfish love that is given without expecting something in return. It also relates to your openness to life, your ego and your compassion towards everyone in the world. 5. Throat Chakra. This chakra is represented by the color sky blue and is located in the hollow of the throat. It has sixteen petals and is associated with expansion and is a symbol for the gateway into liberation. The animal that represents this chakra is the elephant again, but this time, the elephant is free. This chakra has two openings, facing front and back and this chakra is related to the bronchial and vocal apparatus, lungs and thyroid gland. In more psychological terms, it is connected to knowing when to express ourselves and when to remain silent. It is not about a specific language, accent or the way you express yourself, but rather your inner voice, the meaning of your words, hearing others and silence. 6. Third Eye Chakra. This chakra is represented by the color purple and is located in the middle of your forehead. It has two large white petals and is associated with harmony of mind. There is no animal associated with this chakra . This chakra has two openings, facing front and back and this chakra is related to the lower brain, left eye, ears, nose and nervous system. This chakra transcends all of our five senses. In more psychological terms, it is connected to spiritual enlightenment, visualization of higher concepts and direct knowledge. 7. Crown Chakra. The last of the chakras locations is at the top of your head. This chakra is represented by the color violet or white. It has more than a thousand petals and there is no element or animal associated with this chakra. This chakra open upwards and is related to the upper brain, right eye,and the pineal gland. In more psychological terms, it is connected to an extremely high level of consciousness, fulfillment, enlightenment and bliss. 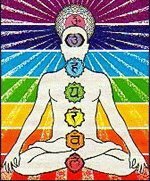 You should now know the basic facts about chakras locations, chakras meanings and their colors. If you have any questions about chakras locations, I recommend one of the following books. Click on the picture to learn more about them.